When it comes to dieting and healthy living, you may have a support group, but are they available at 2 a.m.? Can they stop you from a bad decision at the vending machine or respond immediately with an encouraging shout-out? Your Twitter Diet can, and best of all this army of supporters is free! TV reporter and online columnist Rebecca Regnier discovered Twitter and turned it into her personal weight loss machine. With daily tweeting and the support of her customized Twitter community, Rebecca lost twenty pounds. With Your Twitter Diet, now you can supercharge your own weight loss program by harnessing the power of Twitter and millions of tweeters that fuel this amazing social media platform. There are millions of people achieving success through Twitter from business, to entertainment, and now to weight loss. Learn how you can too with Your Twitter Diet—and get ready to zip up those smaller jeans hiding in the back of your closet. 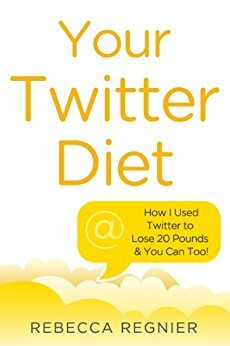 Whether you’re counting calories or carbohydrates Your Twitter Diet proves that anyone can lose weight, 140 characters at a time!